The International Institute for Applied Systems Analysis (IIASA) has released their EU-backed study on the merits of creating a Mediterranean emissions control area (ECA), finding the creation of such a zone would be both cost-effective and provide benefits to human health. 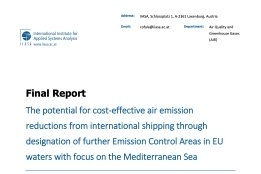 In terms of emissions reductions, the study finds that designation of the Mediterranean Sea as an ECA could by 2030 cut emissions of SO2 and NOx from international shipping by 80 and 20% respectively, compared to current legislation. "It is found that further controls of SO₂ emissions, e.g., through SO₂ emission control areas, could deliver rather fast benefits, and avoid by 2030 up to 4000 cases of premature deaths annually, and 8000 in 2050," the report says. "Even when using the lower (most conservative) health valuation, all reduction measures examined in the report emerged as cost-effective, with monetized benefits exceeding emission control costs typically by a factor of 6 in 2030 and by a factor of 12 in 2050." The report adds to a similar French study released last month that came to a similar conclusion. "The European Commission's impact assessment reconfirms latest findings of the French ECAMED report which has been published two weeks ago. Both studies come to the conclusion that a combined SECA and NECA will have the greatest benefit as this design would result in cleaner and healthier air for all residents in Mediterranean countries," said Beate Klünder, transport policy officer at Germany-based environmental group NABU.